Many of my best market indicators track what individual stocks are doing to see if momentum and trending are spread out among issues or limited to a relative handful. It is difficult, however, to track a large number of stocks in real time to see how many are making new highs or new lows, how many are above their moving averages , etc. What to do? One way around that limitation is to create a basket of stocks that closely track the stock index that you're trading. The basket that I currently use takes four stocks from each of four sectors (industrial/cyclical, consumer, financial, and technology), plus one stock that is an economically sensitive service firm. The basket, taken together, closely correlates with price changes in the S&P 500 Index. This is not surprising, because many of the stocks are highly weighted in the S&P and all are considered large caps. In my scheduled "Morning With the Doc" on October 31st, I will outline what these stocks are and how I use them intraday. For now, notice on the chart how the percentage of stocks in my basket making new five day highs minus lows (blue line) tracks the $SPX. Dips below zero (meaning more stocks are making five-day lows than highs) have been good buying opportunities; price highs when new highs are below 50% have tended to correct in the short term; and price highs with many new highs have tended to move higher still. Since 2004 (N = 705), when we've had a five-day high in the S&P 500 Index (N = 247) and more than 50% of the basket of stocks have made new highs (N = 76), the next five days in $SPX average a gain of .26% (44 up, 32 down). That is better than the average five-day gain of .15% for the entire sample. When fewer than 50% of the stocks are participating in the new highs, the average five day gain is only .01% (96 up, 75 down) and when fewer than 25% of stocks in the basket are making new highs when we have a new high in $SPX, the average five-day change is a loss of -.15% (40 up, 39 down). In other words, we have yet another example of a momentum effect. What is important is not just if the index is making new highs, but if the new highs are broadly distributed. A small but well-constructed basket of stocks can be an effective way to track that. 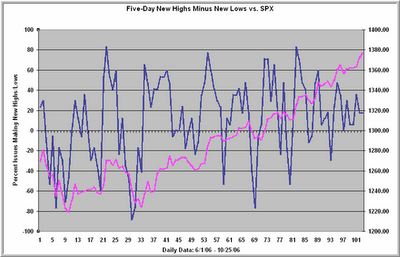 Notice that recent new index highs have been on relatively weak new stock highs. That is a reason for caution right here. More on this worthwhile method in the session on the 31st. When VIX Is Low, Will The Next Day Be Slow? When New Lows Swell, Is It Time To Sell? When New Highs Get Higher, Should You Be a Buyer? When Lots of Stocks Are High, Should You Buy? Is a Rising Market Due for a Fall--Or Not At All? When Selling Becomes Extreme: What Does It Bring? When is a Really Great Time to Buy Stocks? Big Buying Days: What Comes Next? Are Technical Indicators Relevant for Daytraders?